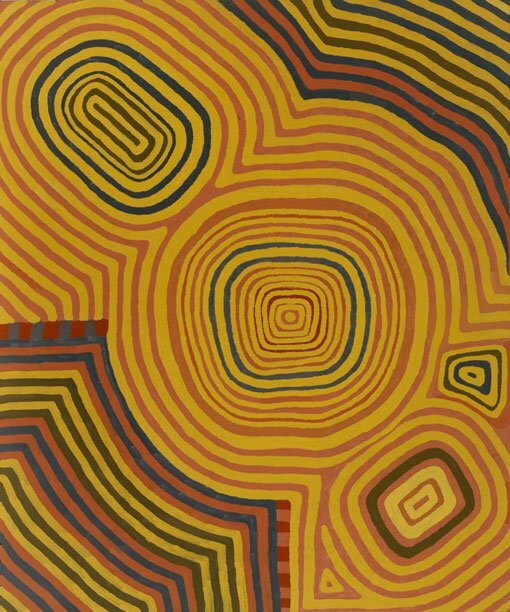 Celebrating the 40-year career of leading Aboriginal painter Ronnie Tjampitjinpa. Pintupi artist Ronnie Tjampitjinpa was one of the youngest of the group of men who began painting at Papunya in 1971, which led to the emergence of the Western Desert art movement. A founder of the hugely influential Papunya Tula Artists, he became as one of their major painters in the early 1990s and continues to paint today. Tjampitjinpa is most recognised for his bold, graphic paintings that explore the Tingari ancestors and their travels over vast areas of the Western Desert region.